IBM® Spectrum Scale is software that is used to manage storage, provide massive scale, a global namespace, and high performance with several enterprise features. IBM Spectrum™ Scale is used in clustered environments and provides file protocol (POSIX, NFS, and SMB) and object protocol (Swift and S3) with unified access capabilities. OpenStack is open source software that is widely used as a base to build cloud and infrastructure as a service solutions. OpenStack often is deployed on commodity hardware and is used to virtualize various parts of the infrastructure (compute, storage, and network) to ease the sharing of the infrastructure across applications, use cases, or workloads. Configuring IBM Spectrum Scale™ in systems that use OpenStack software offers benefits that are provided by the many enterprise features in IBM Spectrum Scale. It also consolidates storage for various OpenStack components and applications that are running on top of the OpenStack infrastructure under a single storage management plane. This IBM Redguide™ publication describes the benefits and best practice recommendations of the use of IBM Spectrum Scale in OpenStack environments. 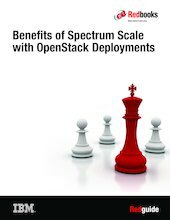 The intended audience for this publication is technical decision makers, cloud architects, IT architects, and those readers who want to learn more about deploying an OpenStack cloud environment with Spectrum Scale storage.